Well. This is a review I have been avoiding for a while. I finished reading The Mighty Dead about two weeks ago. I’d made some notes, but it is hard to put them together and get to the point of what I really think about this book. The fact is I feel quite strongly about it. It is, simply, a book I had been waiting for. One I dreamed would exist in some form. I don’t think I realised just how much I wanted this book to appear until it did. And yet I didn’t pounce on it when the hardback was first released – partly because of the expense and heft of the book, but also because I was nervous about reading it. What if it wasn’t all I hoped it would be? What if I didn’t like the writing or the author’s opinions? There are always reasons not to do things. In the end it was, inevitably, a blog post that convinced me The Mighty Dead would be ‘safe’ to read, and that I should just go for it. The fantastic Carolyn of Rosemary and Reading Glasses wrote a brilliant post that I could not ignore. She was my fellow reader and sent away all my worries. I had to read this book! So thank you Carolyn. Adam Nicolson has great passion for Homer, and he is a wonderful guide to the works themselves, as well as the concepts and ideas within them, and the cultural and historical context and influence of both The Iliad and The Odyssey. His writing is academic yet accessible, conversational but not too chatty, and he includes scenes from his own life that add context and reality to elements of Homer, relating them to real life in the most beautiful and effective ways. He is a wonderful writer. The chapter divisions are very effective. Nicolson takes us on a journey of how one come to love and understand Homer, but also through the different sides of Homer – the poems themselves, their time and place, a bit of text analysis, as well as the context and influence of the poems. There is a spattering of European history throughout the book as Nicolson relates Homer to a world we know, or at least know of. All this is utterly fascinating, and I feel that I really learned something new and can now appreciate Homer in a new way, as something that is an integral part of Euro-Asian (well the western part of Asia) history. That is something very special. 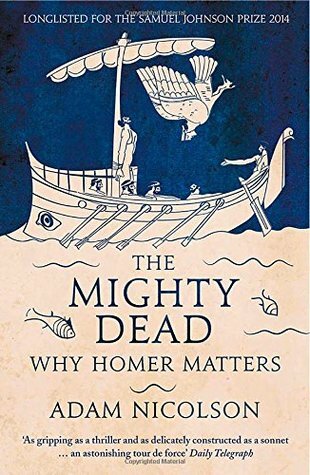 You probably do need to have at least some knowledge of Homer in order to read The Mighty Dead; but I do think that it could also serve as a very thorough introduction for someone who has perhaps heard about The Iliad and The Odyssey, and wants to know more before reading them. It is certainly a good idea to know something about the poems before you read them, even if only basic context. I think the more you understand the poems, the more you appreciate them. They are simply wonderful. I first read The Odyssey at school, where I studied it at both GCSE and A Level. Going through it twice – both times with the same dedicated and inspiring teacher – meant that I am immensely fond of it. I haven’t read it all the way through in a while, but I remembered almost all of the scenes Nicolson references in The Mighty Dead, and my prior knowledge meant that I could revel in the analysis and exploration of its characters and themes. For me, almost all of life is covered by and contained within The Odyssey. It taught me a lot about storytelling, leadership, love and family, the passage of time, dealing with the past – and looking to the future. It is undeniably Ancient Greek and of its time, but it is also universal. In my opinion everyone should read it. I have never studied The Iliad, but have read it on my own, which made me appreciate about much it helps to be guided through Homer. Reading it ‘alone’ can sometimes be overwhelming – so a book like The Mighty Dead really is a godsend. The Iliad is different from The Odyssey in many ways, but it still encompasses most of life. Simone Weil called it a ‘poem of force‘, which makes sense – it is intense, visceral, full of power, desire, physicality, love, life, and death. This is why the two poems, and Homer, have survived history and are still with us – they speak to us of things we never knew, but also of things we’ve known all along in some way, in our hearts, even if we didn’t really know that we knew them. It is difficult to explain this – the point is that I urge you to read Homer if you haven’t already and to re-read if you have, as I plan to; and to read The Mighty Dead by Adam Nicolson. It is just brilliant. Published in 2014 by Henry Holt in the US and William Collins in the UK.